I'd fallen into a deep sleep almost as soon as l got into my futon but when I woke up it was still on the the wrong side of midnight. The temple was incredibly quiet and after listening to the silence I fell asleep until I woke up again at 04:30. Morning prayers were at 06:30 so I slowly started to get myself ready. I lit some more incense, selected 2 photographs and together with my osamafuda placed them all on altar in front of the seated Buddha statue. I then quietly packed most of my possessions back into the backpack and at 06:15, dressed in my white pilgrim's jacket I left my room and headed for the prayer hall. I spotted movement around the dark altar area and greeted a monk who was making preparations for the morning service. He was lighting candles and positioning various implements here and there. In front of the altar was a box for offering money and in front of that two small box shaped incense burners. Then there was a space where those who were staying at the temple would be seated. There was a row of chairs along the back wall and space enough for 2 rows of people to sit on the floor. I was the first of the guests to enter so I positioned myself at the front just right of the the incense burners. From there I figured I would have a good clear view of whatever was going to take place with regards to the ceremony. A seat a little further back would have been better but from past experience they were better left for the use of the more elderly and less mobile guests. As 06:30 approached most of the guests had assembled in front of the altar. A man sat down to my left and he too was dressed in a pilgrim's jacket. From a quick conversation before the main prayer service started he told me he had done the pilgrimage in parts over a number of years and was at Koyasan to share in the 1200th anniversary celebrations. Conversation was short and brief because around the altar everything seemed to be ready for the prayer service to start. One monk was seated on the right side and he made a few ritual hand movements under a white cloth slung across the front of his body. On the other side of the altar was the woman monk who had greeted me and explained everything to be yesterday. Finally, just before 06:30, an elderly monk, who I assumed was the head monk of the temple came in and seated himself at the very front on a raised platform with his back to all the guests. The prayer service was about to begin. The monk seated on the right started a slow chant and a little while later the woman monk on the other side joined in with the same chant. The woman monk kept her eyes on the monk on the other side and seemed to be following his lead. Both monks would strike a pair of cymbals in unison every now and then. The cymbals made an interesting clanging and reverberating sound which continued for several seconds after each strike. The monk seated in the center on the raised platform sometimes struck a small gong and at times seemed to chant something entirely different from what the other two monks were chanting. This continued for 15 or 20 minutes. It was all fascinating and I would have enjoyed it much more had my left hip not been hurting me so much. Most people seated on the floor were sitting in on their heels in the traditional Japanese style. I could have managed it for about 15 or 20 minutes but my left hip had been really hurting me so I was trying my best to just sit cross legged. I was unable to sit still and was constantly adjusting my position. The man to my left encouraged me to stretch my legs out and the lady to my right tried to make a little more space for me. When the chanting by the two monks on the sides came to an end, the lady monk got up and instructed some guests in the front row to start coming forward in pairs and offering prayers. The head monk continued chanting while people came forward in pairs to offer their prayers. I watched as people took a pinch of powdered incense and place it into the incense burner three times and then join hands to pray. When it came to my turn I shuffled forward a couple of feet and repeated the same actions. 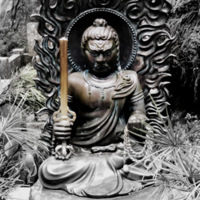 My prayer was a short simple prayer of thanks and I quickly finished by mentally chanting Kukai's sacred mantra before shuffling back to my own spot again. Prayers by the remaining guests took another 15 minutes and it was then that began to recognise the chanting of the more familiar sutras I had heard during the pilgrimage around Shikoku. I recognised one as the heart sutra although some of the words seemed to be different or were pronounced differently. The one sutra I liked more than any other was the short one that was supposed to ward off evil. That one I instantly recognised and joined in silently. 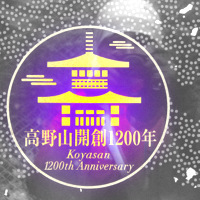 With everyone having prayed and all the sutras chanted the head monk got up and addressed everyone with a short sermon and reminded everyone of the fact that Koyasan was celebrating a 1200th anniversary. After wishing everyone an enjoyable stay at Koyasan he left and the lady monk instructed everyone to head to the second floor to have breakfast. I exited the prayer hall and went upstairs to what turned out to be a huge tatami room with several long rows set out with the same kinds of trays of food we had received in our rooms. I headed to the furthest end of the first row and sat myself down and waited for others to enter and seat themselves too. A young woman who I had seen come forward and pray in the prayer hall came in and headed in my direction and asked if the spot next to me was free, it was, so she seated herself next to me. Her name was Miho and I asked her if she was at Koyasan for the 1200th anniversary celebrations and she told me that she had in fact just come after visiting a few other very well known temples in Japan. Miho had spent 4 days at Eiheiji, a temple I had read about and subsequently had the chance to visit myself. I had read about Eiheiji in a book called Eat Sleep Sit by Kaoru Nonomura and it was about a thirty year old Tokyo designer who had quit his job to spend a whole year undergoing a very tough daily regime at Eiheiji. In his account he wrote mostly about his day to day experiences without any real mention of spiritual experiences. Miho told me she had been working in the financial industry for 9 years but at the end of last year she had quit her job and was planning to channel her efforts into a new type of career helping and coaching others to realize their latent talents. It was interesting meeting her because there was a likelihood that we had met before. Miho it turned out also went to the very same yoga studio I had attended when I had lived in Tokyo. It was a brief encounter but it made me think about the reasons people do these things and why I was doing what I had been doing. I finished my breakfast rather quickly so I could finish my packing and head to Okunoin before it got too crowded. I told Miho I wanted to give her one of my photographs and if she could meet me in 15 minutes by the temple office after finishing her breakfast I would have one for her. With that I excused myself and returned to my room and quickly finished my packing. I selected 2 photographs, one was my favourite from the previous pilgrimage and another was of a some plum blossoms I had taken at one of my favourite parks in Tokyo. When Miho turned up I gave her the 2 photographs and she in turn gave me a small box of cookies. The cookies seemed far too much for my simple offering but I gratefully accepted her gift, wished her an enjoyable stay at Koyasan and then I headed for Okunoin. ﻿I had made the same final little journey in 2011 and on that occasion there had been beautiful early morning sunshine streaming through the trees and hardly a soul in sight. ﻿This morning as I headed back towards Okunoin the wet and misty conditions created for a darker more sombre mood. There were also a lot more people than last time which included a few very large groups making their way towards Okunoin. The peace and quiet was missing but my mission was very simple, it was to offer final prayers and then start the long journey home. I stopped outside Torodo the Lantern Hall to read a sign explaining the history of the building. Most people were heading inside but after finishing reading I headed around the back where I wanted to pray. There was one large group already chanting and praying together. I prepared my candle and incense and when a second smaller group had finished I placed my candle and incense in the usual places and followed the same prayer routine I had followed at all the temples around Shikoku. In my hands I had the small laminated plastic case inside which I had a piece of paper with the main sutras. I read them as I had been doing since the start of the pilgrimage. I still didn't know what they meant but I could now mentally recite them very smoothly. Once I had done that I joined my hands and stood and prayed my own final prayer. It was a simple prayer expressing gratitude for my journey around Shikoku and for the strength to make the changes that I wanted to see in my life. As I had been doing at all the temples I also sought blessings for family, friends, my fellow pilgrims and all beings. I finished with three recitations of Kukai's sacred mantra. I bowed and headed away back around to the side of the Torodo and away from the crowds. I walked slowly back along the path I had come, stopping every now and then to take photographs. Along the way I met the man who had been sitting next to me in the prayer hall at Jofukuin during the morning service. I had really wanted to give him a photograph but since I didn't have the photographs with me, I told him I would leave one for him at the temple office and that he should ask for it there when he got back. Back at Jofukuin I collected my pack and settled my bill at temple office. The costs turned out to be ¥10,000, the same cost I had paid to stay in a room a third of the size in 2011. I thanked the lady monk for putting me in such a nice room. It wasn't just the size I had liked about it, I had liked everything about it. She told me she had chosen that particular room just for me. I thanked her again and headed to the Shukubo Association to check on train times for trains to Osaka. I was busy looking up the train times and looking at my online messages when I was greeted by someone who looked strangely familiar. After a few moments I suddenly realized who it was, it was the man I had met on the very first day of my pilgrimage at Aizen-in just after Konsenji (#3). I had enjoyed some snacks outside and he had done a very nice stamp in my book. I took my book out to show him the stamp again. It was kind of nice that someone who I had met on the very first day of my pilgrimage I was meeting again on what was the final day of my pilgrimage. He said he had been at Koyasan for a while because of the special anniversary celebrations. I thanked him again for the snacks and the hot grilled piece of mountain potato his wife had quickly prepared for me that day. As I was thinking what a small world it was, someone else greeted me. He was wearing a face mask but I instantly knew who it was from the sound of his voice and his sheer size. It was the monk from Meitokuji. I started speaking to him in English and thanked him for letting me stay even though had turned up far too early. He told me to speak in Japanese so I repeated everything again in Japanese. He said he was visiting because of the celebrations and was in the Shukubo Association to charge up his smartphone. I gave him some of the cookies Miho had given me earlier in the morning and thanked him again as I made my way back outside thinking to myself that it really was a very small world. I caught the bus to Koyasan station and then took a nearly empty cable car back down to Gokurabashi station. There was a bit of a wait at Gokurabashi before the local train bound for Namba, Osaka departed. 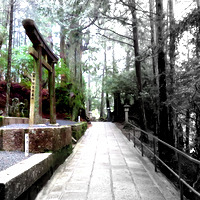 When it did, I just sat back and watched the beautiful scenery around Koyasan passing by. The beautiful scenery slowly morphed into the characteristic city views I was more used to. My pilgrimage really was over and about 90 minutes later the train pulled into Namba station. I now had various options, I could go to Kyoto and visit Toji temple or I could hang about Osaka and take a night bus back to Tokyo. I decided on the latter. I had collected enough stamps in my book and what I wanted most was not to be surrounded by throngs of people. After spending so much time surrounded by nature and being alone it was a sudden shock to the system to be surrounded by so many people again. My first challenge at Namba station was to locate the Information Center. I followed the signs but they didn't seem to lead to anywhere in particular. I went back to where I started and followed the signs again. Again it was the same problem, with no obvious sign of an Information Center. I asked a local man if he knew where it was and he appeared not to know. Had he known or had I known, the Information Center was about 10 yards behind him and just hidden from view. I told him I would find it and headed to the start again to make sure I had not read the directions wrong. I had not read the directions wrong and I found myself back at the same spot where I had just asked the man a few moments earlier. This time there were a couple of overseas visitors standing there looking equally perplexed so I asked them and they said they were also looking for the Information Center. I decided to go up another floor but told them I would come back and tell them if I found it. On the next floor up I stopped someone I thought was Japanese but turned out to be an English speaking visitor and he told me the Information Center was on the floor below and he gave me the precise location. As I headed back down the down escalator the two other overseas visitors were indicating to me that they too had found it. It was literally yards from where we had been discussing it's location. All that was needed was a small sign to indicate that it was basically just there. Anyway once in the Information Center I enquired about the bus terminal and was told where to go. When I got there I discovered it was a small local bus terminal which did night buses but what I wanted was the bigger JR Bus Terminal so it was back to the Information Center again and this time a different lady gave me a map to the JR Bus Terminal which was located about 15 minutes walk away. I followed in the general directions she had given me and got lost again. However, thanks to another smaller Information Center I eventually picked up the signs to the JR Bus Terminal. At the JR Bus Terminal I asked for the cheapest ticket and the cheapest ticket was just ¥​5,200. The bullet train would have cost about 3 times as much and a more luxurious bus with single seats almost ¥10,000. I was not looking for any real comforts so I got the ticket and now all I needed to do was wait about 8 hours before the 22:50 departure for Tokyo. The first thing I did was walk around the underground shopping malls to find somewhere to eat. I decided on a a small restaurant with counter seating and decided to try some sukiyaki. I ordered a set menu and opted for the large size. When the food arrived the large I discovered applied only to the amount of meat rather than large everything I had hoped for. The friendly chef did however top me with extra hot green tea several times and when I left I decided to give him a photograph. He looked a little perplexed which was understandable but it just seemed like the right thing to do having done it so often over the past 49 days. I had managed to spend a little over an hour for lunch so I still had another 7 hours to kill so I decided to head out of the shopping mall and have a look around. I had briefly passed through Osaka a couple of times but it was not a place I was really familiar with. All I knew was that I was in Namba, and Namba was probably one of many districts in Osaka. From what I could see it didn't seem to be much more than a place for shopping and eating. When I left Koyasan after my first pilgrimage I had gone to Kyoto and even with all the attractions there, after spending so much time surrounded by the nature of Shikoku, I had ended up staying in my hotel and then leaving the following evening after visiting Toji temple. If Kyoto couldn't entice me last time there was little chance of Namba having anything that was going to, so I decided to get myself a coffee and sat myself down in a quiet spot in the waiting area of the bus terminal. Buses arrived, buses departed and 10:50 came around quite quickly. After my bus arrived, I boarded and settled myself into my seat and got my laptop out and started updating my notes.